There is always some risk with anesthesia. We take great care to ensure anesthetic safety. A thorough physical exam is done on your pet before any medications are given. If there are health concerns, other tests such as blood work or x-rays may be recommended. This is one of the reasons our policy is to have an examination appointment prior to surgery if the patient is over 2 years of age. During anesthetic, we use an anesthetic monitoring machine as well as veterinary technicians or assistants. All of our surgical patients have intravenous catheters placed and receive iv fluids during surgery. The fluid rates are adjusted based on blood pressure measurements. The amount and type of anesthetic adjusted based on your pet and the procedure being done. Sometimes local anesthetic (freezing) is used. Preanesthetic blood work is important in reducing the risk of anesthesia. Blood work is a way to assess liver and kidney values to ensure that the patient can process the anesthetic. Even apparently healthy animals can have serious organ system problems that cannot be detected without blood testing. If there is a problem, it is much better to find it before it causes anesthetic or surgical complications. If serious problems are detected, surgery can be postponed until the problem is corrected. We strongly believe in keeping our patients comfortable. This is done by using pain control medications. 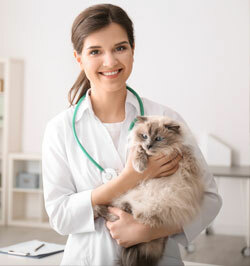 The type of medication and duration of treatment depends on your pet and the procedure being done. Most patients will receive an injection of pain control medication at time of surgery. Usually additional medication is sent home to be given by mouth for a time after surgery.